For a Day, Our Political Troubles Were Eclipsed It was beautiful: Up and down Madison Avenue, people stood together and looked upward. In Manhattan on eclipse day I had planned to go by Central Park to witness how people would react to the big celestial event. But I didn’t get there because of what I saw on Madison Avenue. 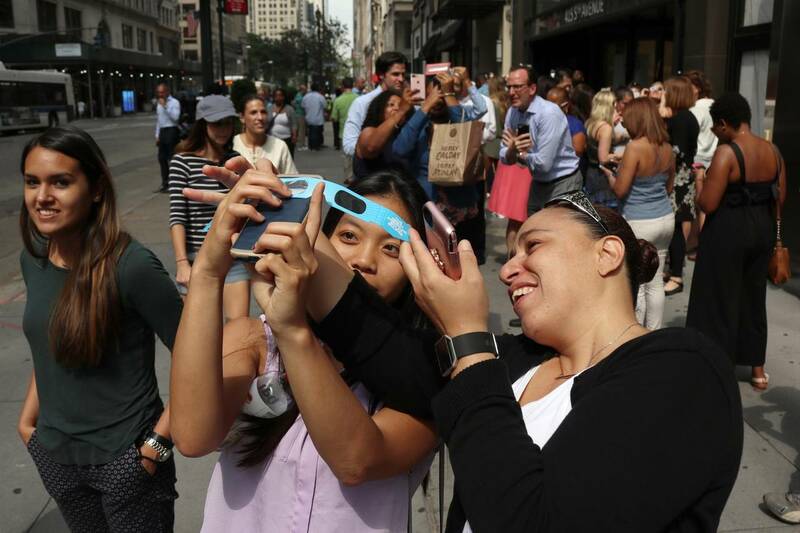 Up and down the street, all through the eclipse, people spontaneously came together—shop workers and neighborhood mothers, kids and bank employees, shoppers and tourists. They’d gather in groups and look up together. Usually one or two people would have the special glasses, and they’d be passed around. Everyone would put them on and look up and say “Wow!” or “Incredible!” and then laugh and hand the glasses on. Walking south I saw the clusters form and re-form. On Madison and 77th there were 10 people, including a neighborhood woman who’d brought a red plastic colander, which she held so that the shadow it cast on the sidewalk showed the changing shape of the sun. That was a hit with the kids. There were grade schoolers who’d made their own viewing devices from cardboard and cereal boxes. A young woman accepted a pair of glasses, looked up, and said: “Oh my freakin’ God.” Another said: “It’s remarkable.” “Beautiful,” a woman added. “It is, isn’t it?” asked a man walking by. In front of E.A.T. by Eli Zabar, more than two dozen people filled the sidewalk and street. Four had the special glasses that were being passed back and forth. A woman named Beatrice who works at a local real-estate office saw me taking notes and smiled. “Do you wanna see?” I did. She gave me the glasses, and I saw the sun half covered. I told her she would be in The Wall Street Journal on Saturday. Hi, Beatrice. There was a tattooed man in a heavy metal band T-shirt, with his teenage son. “You want?” the man said. He was lending his glasses to everyone who came by. “Are you doing this just to be nice?” I asked. “Yeah,” he said. “We got them free.” Something nice had happened to him so he was spreading it around. There was something about it that left me by the end quite moved. Witnessing spontaneous human graciousness and joy is stirring. And we were seeing something majestic, an assertion of nature and nature’s God, together. It was tenderly communal. And it was this: Everyone was normal. These were regular Americans being nice to one another and to whoever walked by. They were all ages, conditions, races, sizes. They were generous and kindly. No one kept their pleasure to themselves. They were not fighting in the streets with scarfs covering their faces. They were not marching and chanting anti-Semitic or racist slogans. They were not shutting down speakers on campus. They were not ranting at a rally. They were not even deciding that a man named Robert Lee shouldn’t call a game down South on ESPN because Americans are so stupid they’ll think he’s Robert E. Lee and cover him with tarp and knock him down. They were normal, regular people. They were who we are. That’s what so moved me. When the news is bad, as it has been lately, you can lose a sense of perspective. But we are a nation of 325 million. How many of us are neo-Nazi, KKK, Antifa or any other dreadful group? Maybe, in all, a million at most? It’s not much. They’re way outnumbered! You can lose this knowledge watching the news. We are a great people in a nation founded on great beliefs, and though things are troubled at the very top, in Washington, on the levels below and beyond we tend to hash things out and make it all work. And now, here, the dread political part. Maintaining perspective is going to be useful in the future, because our national politics, the news of which pulses nonstop through our many platforms, is probably not going to get better anytime soon. We are in a place we’ve never been. No matter how politically sophisticated you are, you’ve never been to this particular rodeo. We have a president half the country thinks is crazy, insufficient, not up to the job, unsuited for it by temperament, personality or character. But there’s about a third of the country, among whom are some I love, that passionately supports Donald Trump, has faith in him, sees all the forces arrayed against him and pulls for him in the way an American roots for the little guy. If they see him removed and believe it was done unjustly—the swamp strikes back—they will be left embittered and will lose faith in the entire system. This on its own is quite a division. It speaks of basic human perception. Congress will soon be back and is unlikely to get anything major done—not tax reform or infrastructure. The president deliberately insults and offends members of his own party. He thinks his core supporters will agree with his criticisms and blame congressional Republicans for what’s not working. And he’s right, they will. They don’t like the Republican establishment. But this is not a winning strategy. Mr. Trump has simply replaced the old dysfunction (the one that got him elected) with a new dysfunction of his own making. If Republicans on Capitol Hill get nothing done and continue to be attacked by their party’s president, their reelection will be endangered. Mr. Trump may be ensuring that Democrats retake Congress in 2018. Does he understand that the first thing they’ll do when they assume power is launch investigations and move to impeach him? They’ll do it for at least two reasons. One is that hating Mr. Trump is one of the few things that unites their party. The other is that busying themselves with impeachment will allow Democratic leaders to avoid hard fights over what their own party stands for. For it too is warring and riven. But Democrats don’t have to face that while they’re busy with the Trump Removal. Quieting himself now would be wise. But he likely won’t or can’t. If Mr. Trump continues to be unable to get major legislation passed with a Republican Congress, he will become angrier. He’ll hold more rallies to vent. These rallies and what he says at them may well contribute to disruptions, including in the streets. Maybe the special prosecutor will find impeachable offenses. Maybe not. Maybe Mr. Trump will get tired of it all. Maybe not. Maybe he will magically learn how to be president. Maybe not. More likely, the grinding, scalding Trump wars will continue daily. Which will be hard on all of us. What to do when the mess gets you low? One thing is to have perspective on who we are. We have gotten through much. We’ll get through this. We are a great people and a good one who show this to one another every day. Here, take my glasses. Do you see?